Study in Your Home – Dive in Bali! 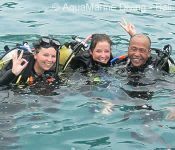 AquaMarine Diving – Bali offers courses alongside PADI’s eLearning courses, these can greatly minimise time spent in the classroom during your holiday. PADI offers an e-learning option, which allows you to complete all the theory in your own time from home. After you have completed your elearning programme and passed your final test (all on-line), your results will be sent to us here at AquaMarine Diving – Bali. When you meet with your AMD-B PADI Instructor, you’ll do a short review of the theory and then ask any questions you may have. Because you choose to study by eLearning, you’ll be in the pool without delay and beginning to work on your water skills that much sooner. If you are unable to use eLearning or are unable to locate a manual before arriving in Bali, we will deliver a manual to your hotel after you arrive in Bali. Or we can bring it to the airport if we are picking you up on arrival. You can then study at your own leisure by the pool or maybe on the beach. More than 70% of AquaMarine’s PADI dive team PADI Instructors or above. They were all recruited not only for their levels of expertise, but also their dedication and commitment to the company. Would you like to get started on your certification before leaving home? Be ready to start your course immediately on arrival in Bali (without the need to spend valuable vacation time studying)? Arrange through AquaMarine to be issued with the appropriate PADI online manual (electronic manual). We will provide the access code so that you can complete your study at home. An additional benefit of choosing to use PADI online manuals is that you then have lifetime access to the PADI information. Alternatively, if you prefer a hard copy of the book, you might choose to purchase the PADI Manual through a dive centre at home; simply enter your city and country, the website will give you a list of your nearest PADI dive centres.